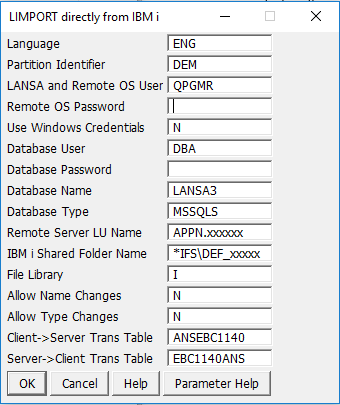 By using the LIMPORT (From IBM i) item in the LANSA, Settings and Administration\Utilities folder, you can execute an import where the imported data is stored in the IFS (Integrated File System) on an IBM i server. The LIMPORT directly from IBM i dialog will be displayed. You must have an active connection to the IBM i server with a valid IBM i profile and password. The profile must have all of the proper IBM i authorities to access the IFS containing import data. The import data in the IFS should have been formatted as a PC export.